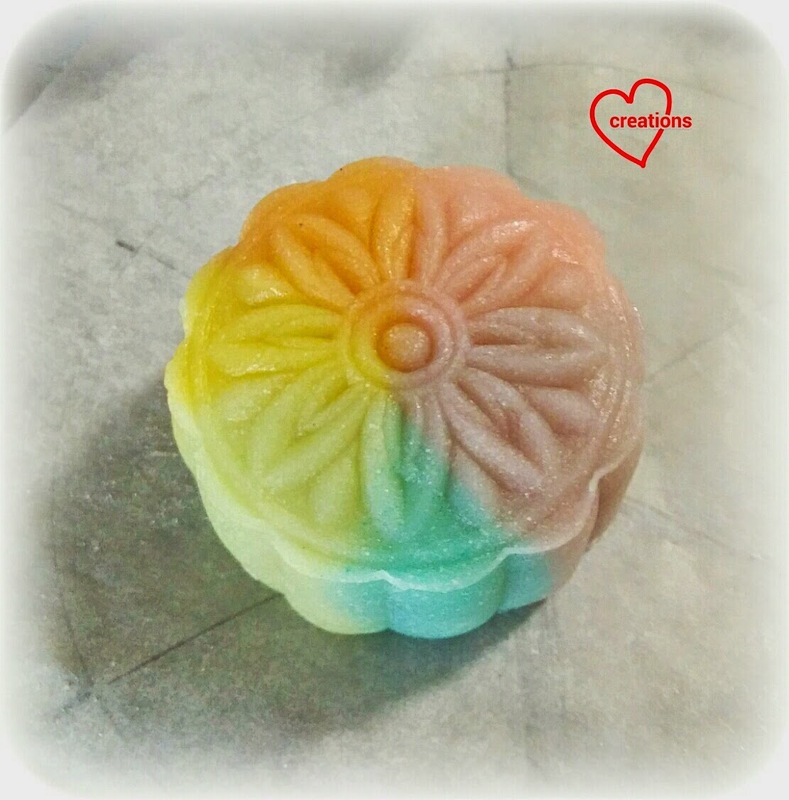 These brought a smile to my face as I was starting to feel like a factory churning out mooncakes :p.
Here's a pastel rainbow moonie! 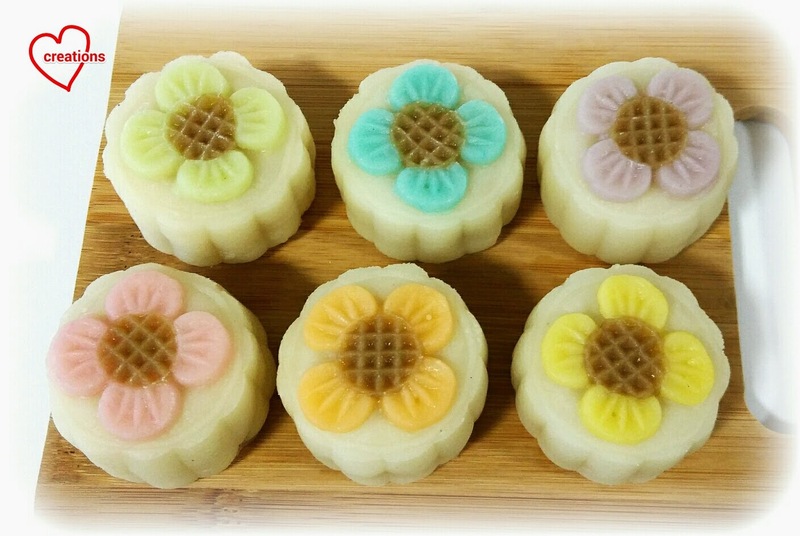 I used the recipe from my previous post to make these snowskin mooncakes. Check out how smooth the dough looks! 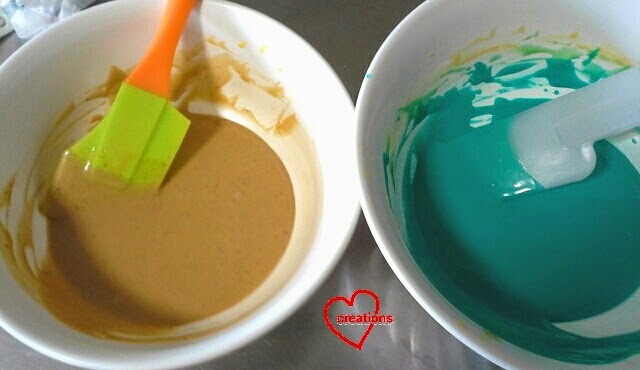 Use liquid food coloring to color the dough as it is easier to incorporate the coloring into the dough than gel food coloring. Remember to use just enough dough to cover the patterns at the base and dust the mould with a bit of kou fen (cooked glutinous rice flour). Otherwise the patterns will not come out nicely. All packed and ready to be served! 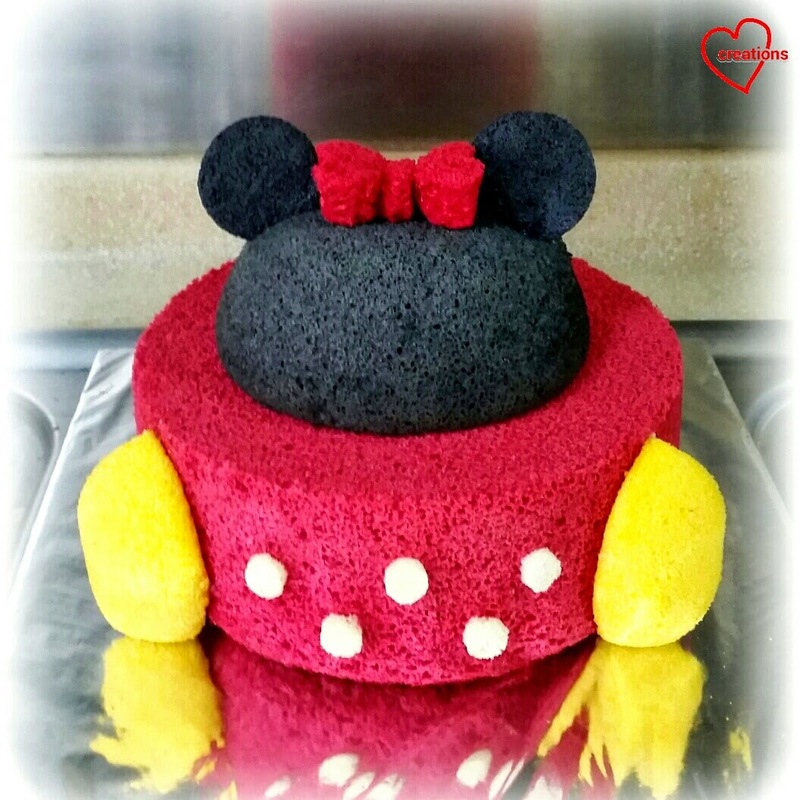 The female version was inspired by Minnie mouse’s trademark pretty polka dot red dress and yellow heels! 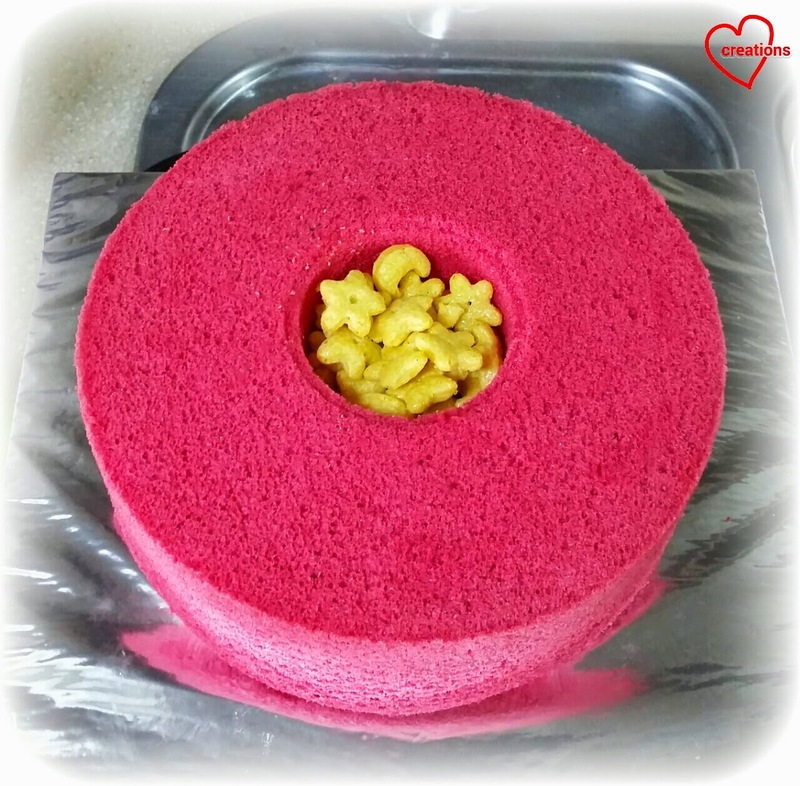 In addition, I made a red bow out of excess batter from the base vanilla chiffon cake. The chiffon cakes are dual-flavoured with orange (for head and shoes) and vanilla (for the red base) as requested by the mummy. Instead of painting on the buttons/dots, I baked another white vanilla chiffon cake (scaled down to 1 egg yolk) this time round and cut them out using round cookie cutters. 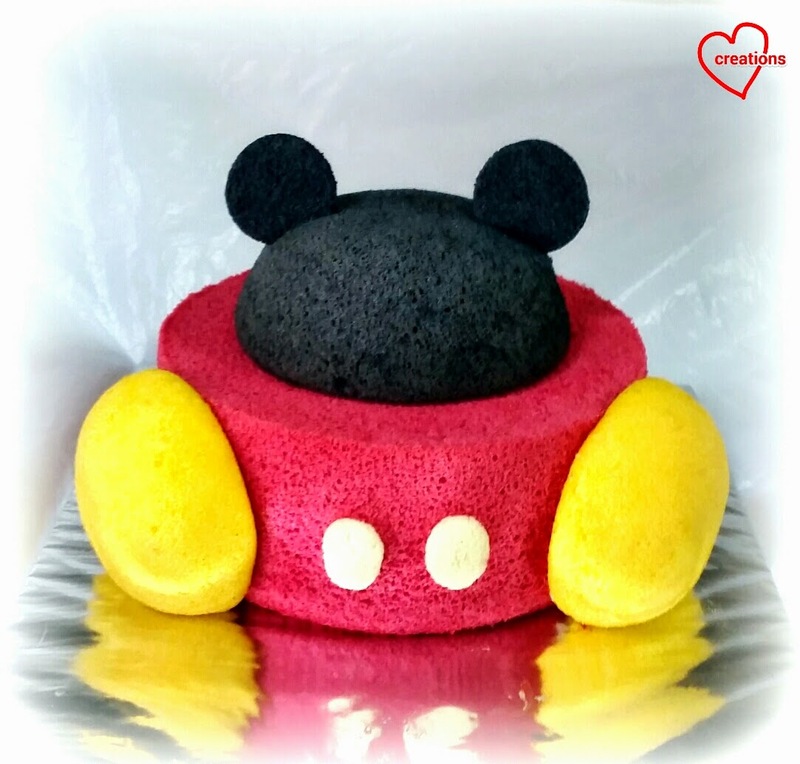 Recipe for the base vanilla (beetroot) chiffon cake is the same as Mickey mouse vanilla chiffon cake. 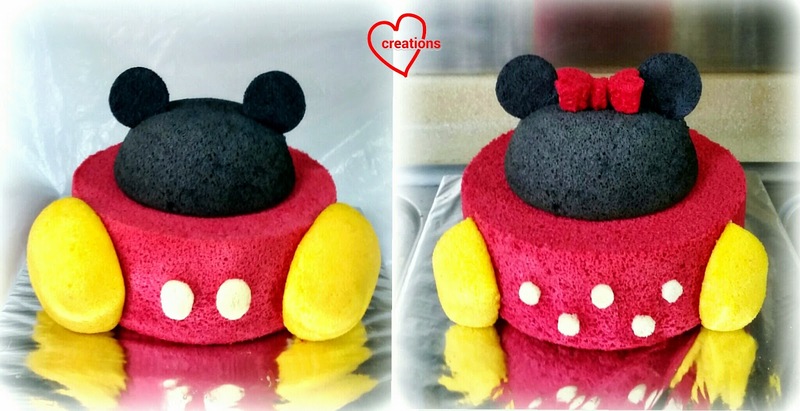 The head and shoes were made from orange chiffon cake, with batter divided into black (charcoal powder) and yellow in 2:1 ratio baked in a big round mould and 2 smaller bowls as previously. I did a little bit of carving to shape the round shoes into heels for the Minnie mouse :). The same vanilla chiffon cake recipe is used for the white cake, scaled down to 1 egg yolk (just divide everything by 3). Remember to omit the beetroot powder for this cake. Everything was then glued together using melted marshmallows. Just add some water and pop the marshmallows into the oven like how you make fondant. 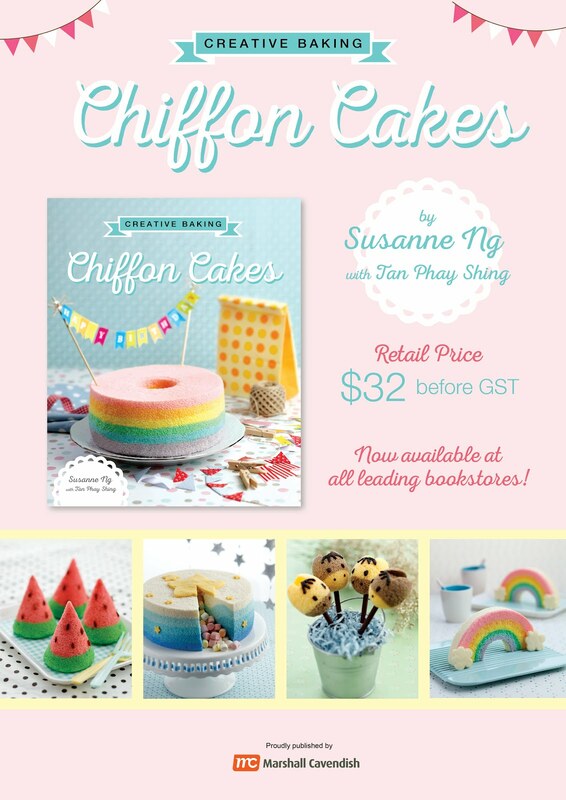 It’s really the best glue for chiffon cake I have used so far. In this version, I further reinforced the chiffon ears using pasta sticks. 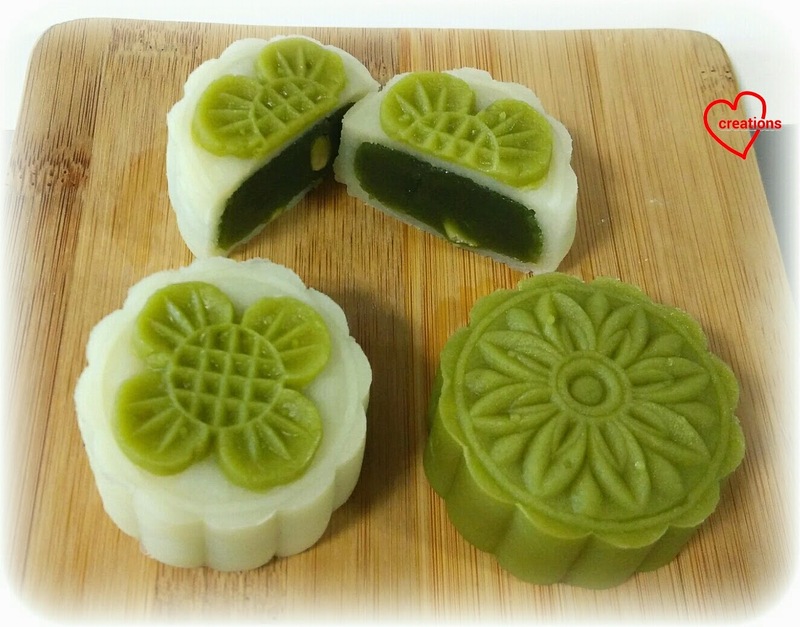 Green tea snowskin mooncakes! Made with snowskin that stays soft even after a week of storage in the fridge! 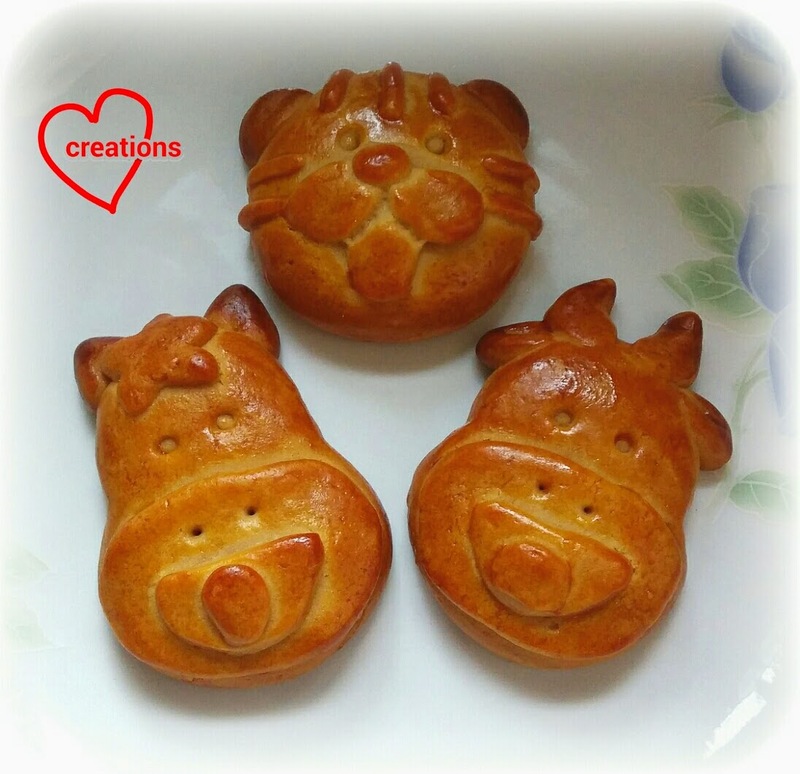 I love Ann Low's snowskin recipe for its smoothness but for the past couple of times I have been using it, I find that the mooncakes are only good for 3 days. By the 4th day, the skin turns dry and hard. I played around with the fat, flour and water ratio and came up with something just as smooth but can keep for a longer time :). I will show you how to get the green tea flower on nicely too! 1. 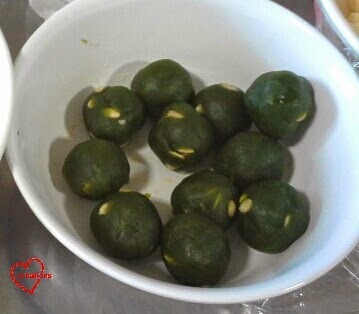 Knead the toasted lotus seeds into the green tea mung bean paste and divide into 23g balls. 2. Mix together kou fen, icing sugar and premix. Sift all three ingredients into a large bowl. 3. Dissolve green tea powder in 130-140ml hot water. Portion out 125g into a small saucepan. Add shortening and heat over low heat. Keep stirring until shortening has melted. It is not necessary to bring it to a boil. 4. Pour the hot liquid into the sifted flour mixture and use a spatula to stir until a dough forms. Leave to cool until it is cool enough to handle before kneading until smooth. This waiting time is necessary for the dough to be smooth. 5. Portion the dough into 24-25g balls. 6. Place a ball of dough between baking sheets and flatten using your palm. Place a ball of paste in the middle and wrap it. Lightly dust the surface with kou fen. 7. 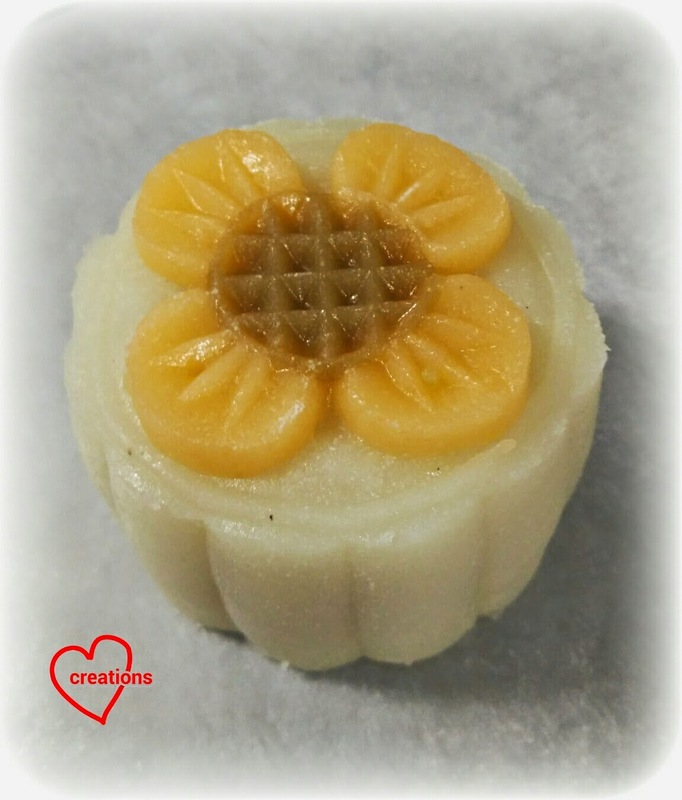 If you would like to make the flower pattern in a different color, dust the pattern on the mould with a bit of kou fen and place a small amount of different colored dough into the mould such that it covers the pattern nicely. Cover your finger tip with cling wrap to prevent the dough from sticking to your finger. 8. 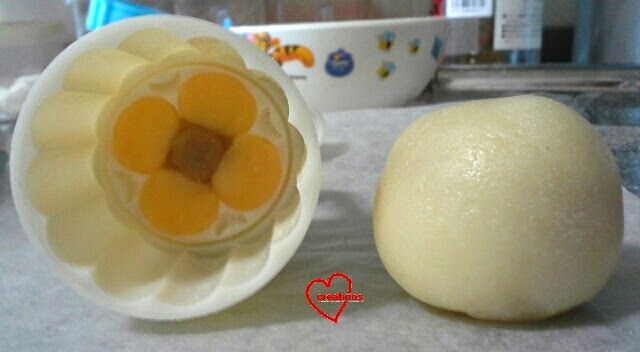 Place the ball of filling wrapped with dough into the mould. Press it firmly and push it out of the mould. 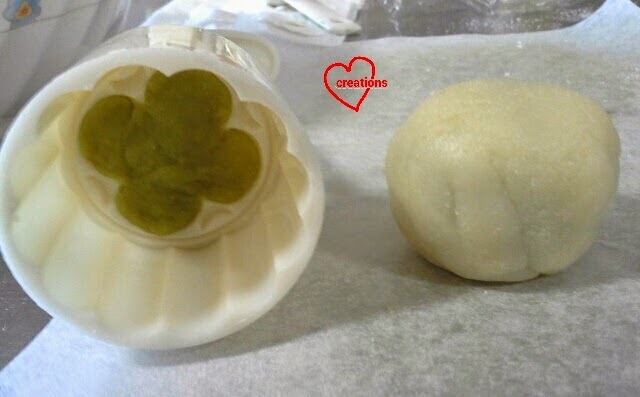 Getting one of those moulds with plunger is very helpful as you can dust with less flour, thus helping to keep the mooncakes moist for a longer time. 9. Chill the mooncakes for a few hours before consuming. 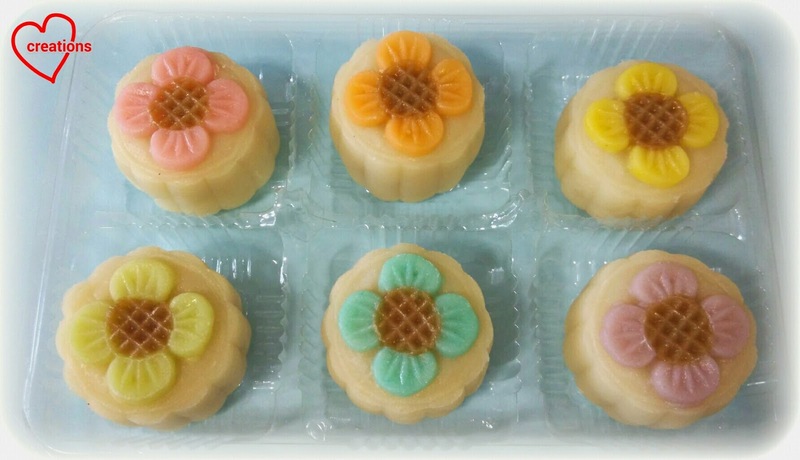 Store the mooncakes in an airtight container that is not too big for the mooncakes in the fridge. 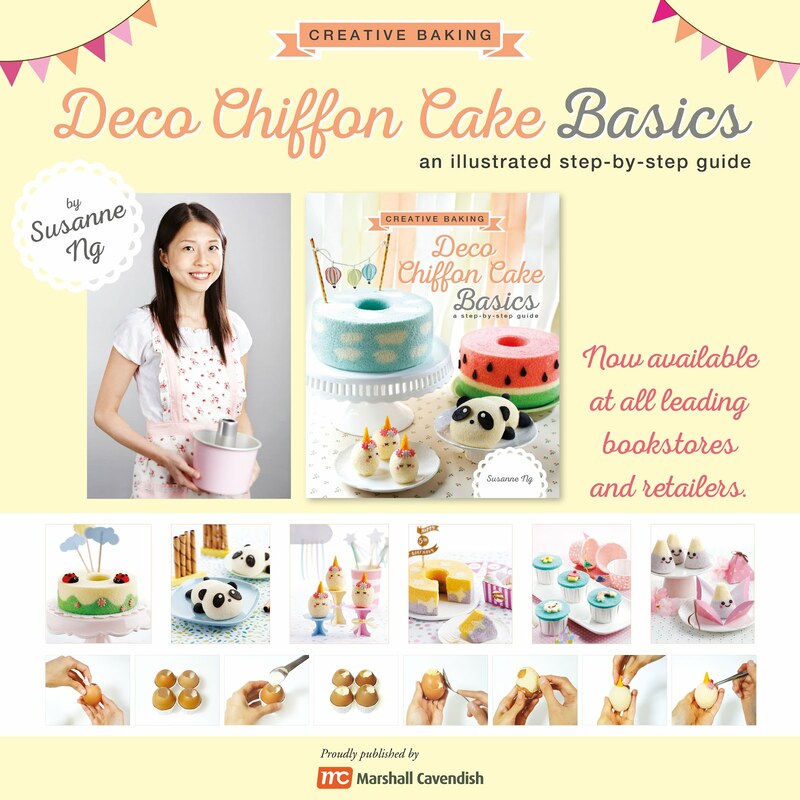 I'm joining Best Recipes for Everyone August 2014 Event Theme: Dim Sum hosted by Fion XuanHom's Mom. 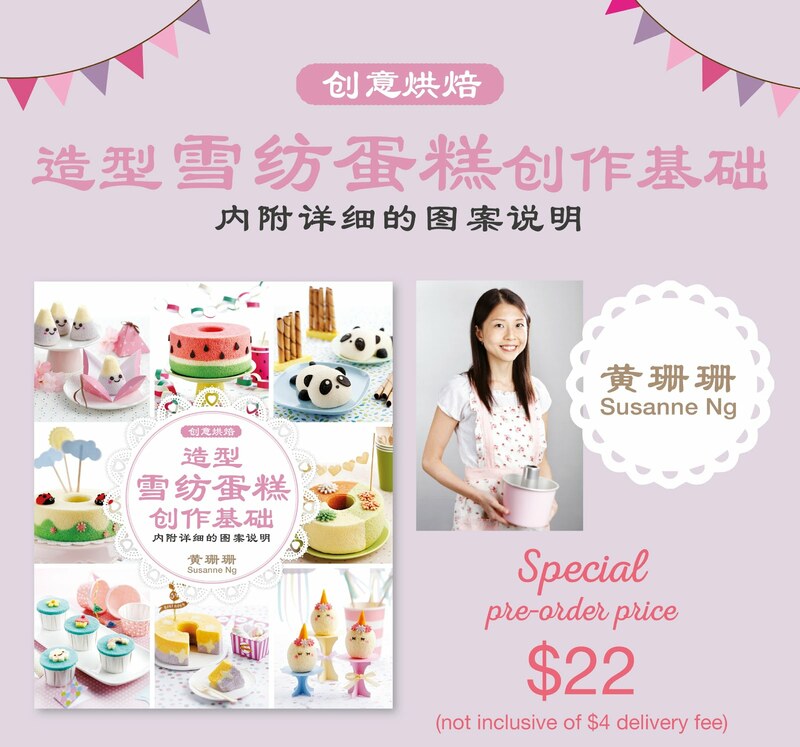 Check out this recipe for steamed soft cakes if you have any leftover kou fen that you don't know what to do with. This is my biggest birthday bake so far! Big cake plus mini cupcakes! 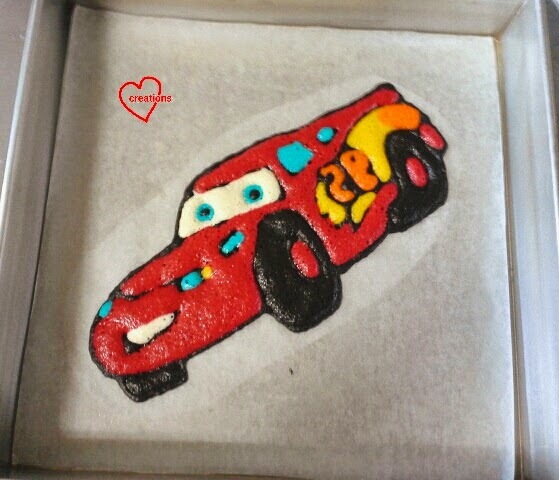 As requested by my friend, I was supposed to make a Lightning Mcqueen chocolate cake for her boy that is enough to feed 40-50 people. This is another long post so bear with me and skip any portions that are not of interest :). Here's the big cake! 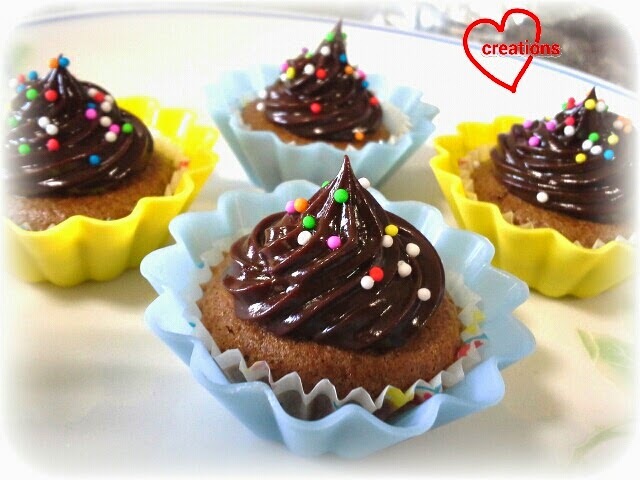 Here are the mini cuppies! I made 30 of them. I adapted the chocolate cake recipe from my black forest chiffon cake. The difference is I left out the kirsch and substituted water with milk and cream to make the cake more rich and moist but still light and fluffy since there is no dietary concern here. 1. Preheat the oven to 160 degrees Celsius. Line the base of the pan with baking sheet. 2. Whisk egg yolks and sugar until pale and sugar has dissolved. Add oil and whisk until well combined. Add milk, cream and vanilla extract until well combined. Gradually add in sifted flour, cocoa powder, salt, baking powder and baking soda. Whisk until no trace of flour is seen. 3. Prepare the meringue. In a clean metal bowl, use an electric mixer to beat egg whites until foamy. Add cream of tartar and beat until soft peaks form. Gradually add sugar and beat until stiff peaks form and the bowl can be overturned without the meringue falling out. 4. Fold the meringue into the egg yolk batter in three additions quickly but gently. 5. Slowly pour the batter into the pan to pop any trapped air bubbles. Tap the pan a few times on the table to release any more trapped air. Bake for 18-20 minutes or until the skewer comes out clean. (Bake for longer time if you ate baking one single big cake). 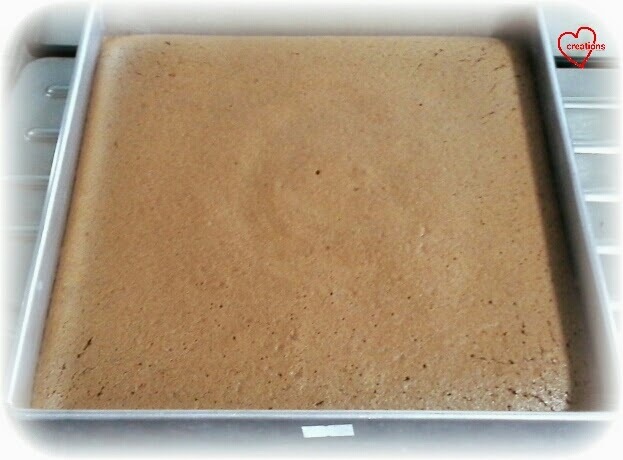 Let the cake cool in the pan for a few minutes before turning it out onto a cooling rack to cool. Cover the cake with a baking sheet when cooling to avoid drying out the cake. You may wrap the cakes in cling wrap and freeze it until it is time to assemble. Please refer to my previous post for the recipe and checkerboard shaping instructions. I iced the vanilla cookies with blue royal icing and the chocolate cookies with yellow royal icing. I used the just-add-water type of royal icing sugar and pipied it on using Wilton #3 tip. 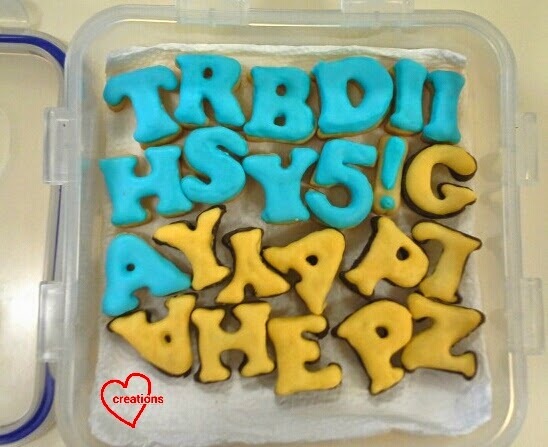 The iced cookies were dried in oven for 30 minutes at 90-100 degrees Celsius, cooled down and then stored in airtight container. Iced and ready to be packed. I used the vanilla sponge recipe from my sunflower birthday bake. Make sure that you prepare all the ingredients and logistics before hand as you don't want to mess up halfway through. Needless to say, this is the most challenging part of the birthday cake. I was pretty nervous :p.
1. Prepare small piping bags out of baking sheet by making paper cones. Staple the sides to hold the cone shape in place. You will need to snip off a small hole at the tip after the batter is poures in. 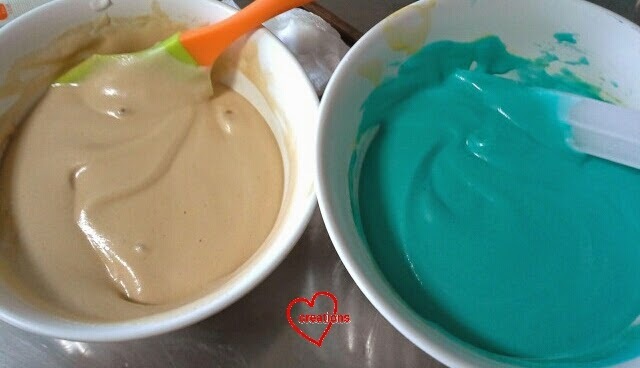 You may prefer to prepare all 6 colors using this but I prefer to use this only for small amounts of batter (blue, orange, yellow and white). I prepared ziplock bags fitted with wilton tips for black and red, with wilton #3 tip for black and #5 tip for red. 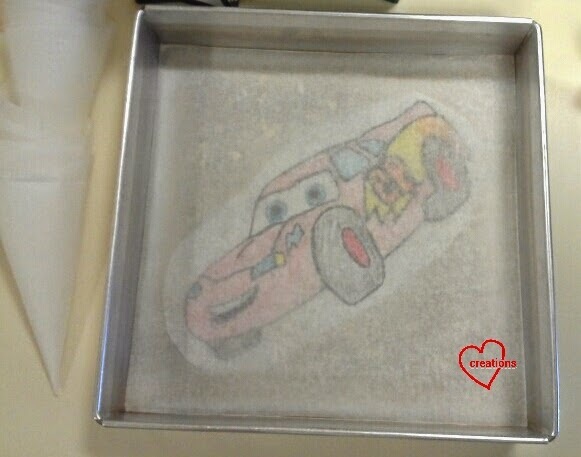 Place the Lightning Mcqueen template in the 10" baking tray and place a baking sheet over it. Remember to use the reversed image of Mcqueen! Lightly grease the surface of the baking sheet with oil. You don't have to use a colored template like me. I was afraid that I would end up piping the wrong color at the wrong place. 2. Preheat the oven to 165-170 degrees Celsius. 3. Make the egg yolk batter. Whisk the egg yolks and sugar until pale and all the sugar has dissolved. Add oil and whisk until thick and well combined. Add milk and vanilla extract and mix well. Gradually add in sifted flour, salt and baking powder until no trace of flour is seen. 4. Portion the egg yolk batter accordingly for all the colors of the pattern. 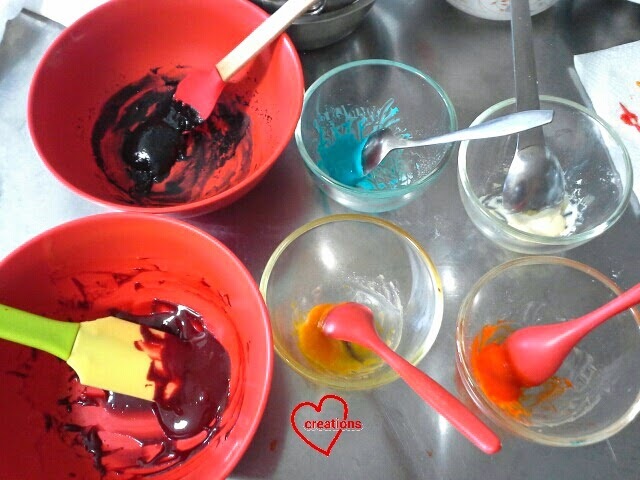 Mix all ingredients for each color except the meringue. 5. 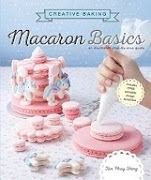 Prepare the meringue for the pattern. In a clean metal bowl, beat the egg white until foamy. Add cream of tartar and beat until soft peaks form. Gradually add sugar and beat until stiff peaks form and the bowl can be overturned without the meringue falling out. 6. Fold the meringue in 2-3 additions into the respective pattern egg yolk batters and transfer into the piping bags. First, pipe the black outlines except for the eyes. Pipe the blue part of the eyes, leaving out the black. Bake for 30 seconds-1 minute or until batter is dry. If you find that the black outline spread a bit too much, you may use a toothpick to carefully remove some of it. E.g. my number 95 ended up without space for the orange at one section. I just scraped it off. Next, fill in the different colors, working as quickly as you can. Bake for 1.5-2 minutes or until the batter is dry. Phew! That doesn't look too bad :). 7. 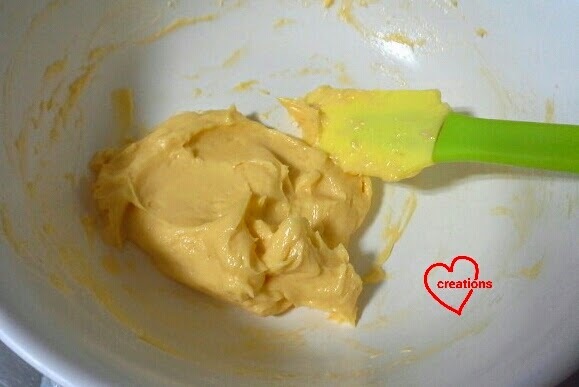 Divide the remaining egg yolk batter into 2. This is optional if you wish to have a single color for the background. 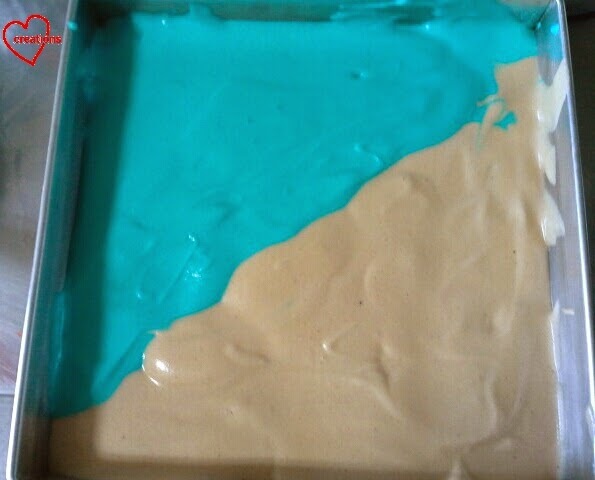 Add blue and white gel food coloring to one portion and sifted cocoa powder to the other. 8. Prepare the meringue for the main batter in the same way as the pattern and fold into the egg yolk batters in 3 additions. 9. Carefully scoop the batter into the pan, forming the ground and the sky of the picture. Tap the baking tray a few times on the table to get rid of trapped air bubbles. 10. Bake for 14 minutes or until skewer comes out clean. Immediately remove from pan and carefully peel off the baking sheet. Cool the cake with another baking sheet over it to prevent it from drying out. You may wrap the cake in cling wrap and freeze it until it is time to assemble. Done! Not perfect but better than I expected. It just needs some minor touching up. 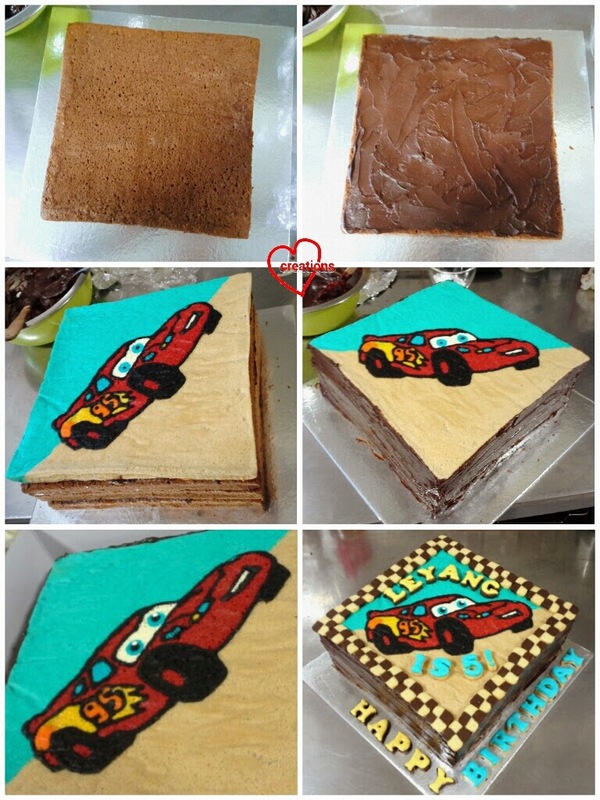 Some wrinkling of the cake is unavoidable since baking paper was used to line the tray. Silicone mat would not have this problem but I won't be able to see the fine details of my pattern template if I used my semi translucent mat. I adapted from Ann Low's recipe for the chocolate ganache. This portion of ganache is enough to frost the cake and the mini cupcakes. 1. Place chopped chocolate and butter in a large bowl. 2. Boil the cream in a saucepan. 3. 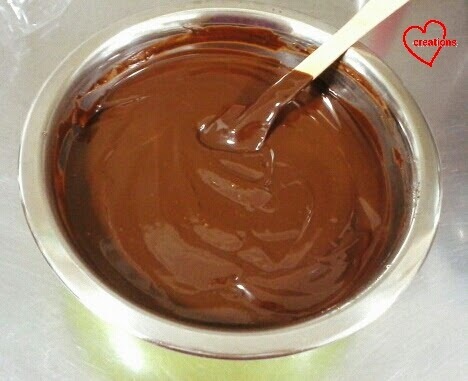 Pour the hot cream into the bowl of chocolate and stir in one direction with a whisk or spatula until all the chocolate has melted and the mixture is smooth. 4. Add vanilla extract and mix well. Set aside and let it cool and thicken at room temperature before applying onto cake. Alternatively you may store it in fridge or freezer until it is time to assemble. If you are storing it first, bring it to room temperature and whip it until smooth before use. 1. 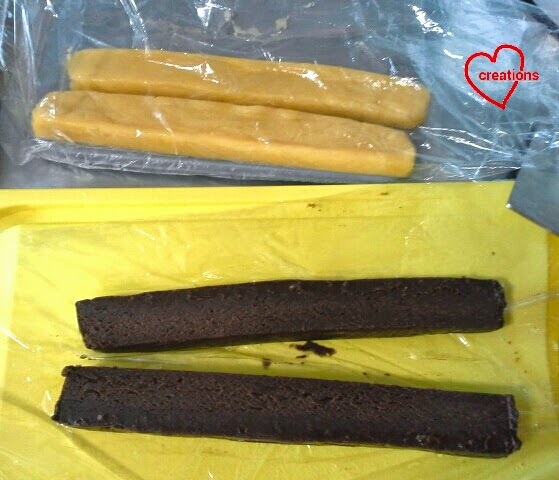 Thaw the frozen cakes (if you froze them) and bring to room temperature before assembly. Place one chocolate cake on cakeboard. 2. Apply a layer of ganache. 3. Place a second layer of cake and apply ganache. Repeat until all cake layers are assembled. 4. Frost the sides of the cake with ganache, smoothing out with a spatula. I just dragged the spatula along a side of the square, starting from the bottom of the cake to the top, creating rustic log cake looking patterns at the sides. You can frost it any way you like :). 5. Touch up any imperfections on the design. I needed to touch up Mcqueen's eyes to make them more lively, and a bit of the sides near the "95". I used charcoal powder dissolved in water to make black paint, milk powder + gel food coloring + water to make white and yellow paint. 6. 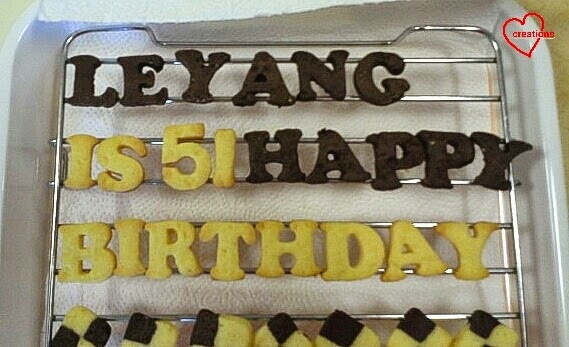 Apply some ganache under the cookie letters and checkerboard pieces and stick them onto the cake/ cakeboard. 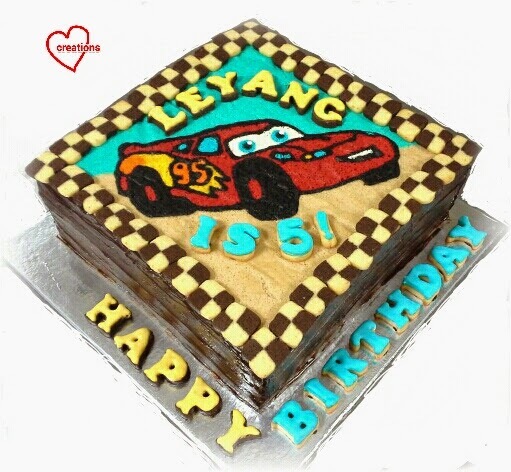 Birthday boy was really delighted to see his favorite car on the cake, especially since it was a surprise party :). Everyone loved the rich chocolatey flavor of the cake! 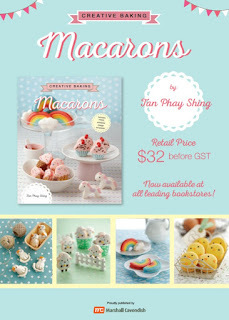 My friend is already planning to get me to bake for her again in a few months time. 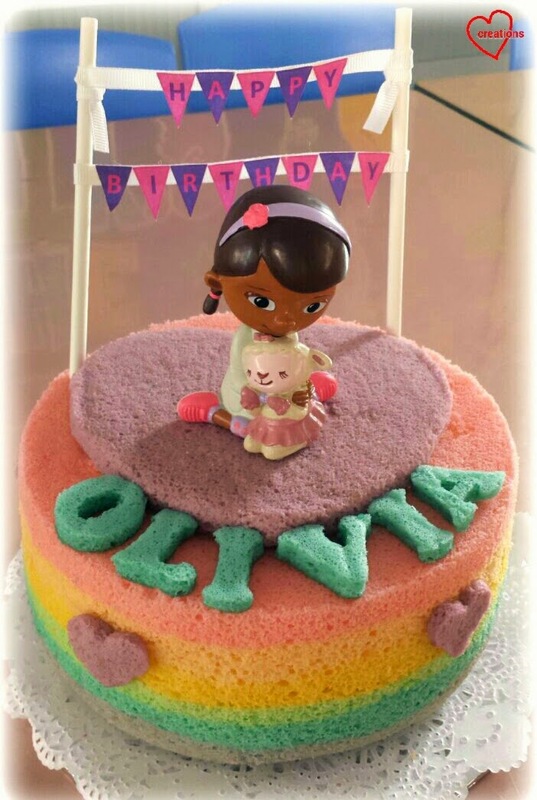 This is a Doc McStuffins-themed pastel rainbow pinata chiffon cake I made for my friend's daughter's birthday! 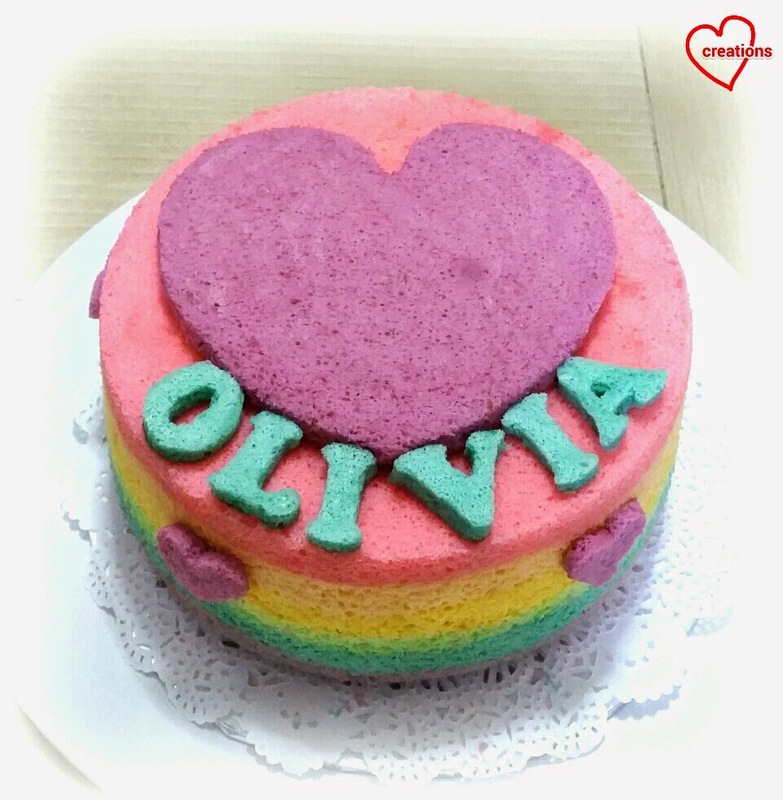 She already had a Doc McStuffins topper so I made a pastel rainbow cake with a pink top decorated with purple hearts and baby blue wordings to match the theme. I could see she really put in a lot of effort to hand make items for the goodie bags, so I was touched and felt I needed to do my best too! 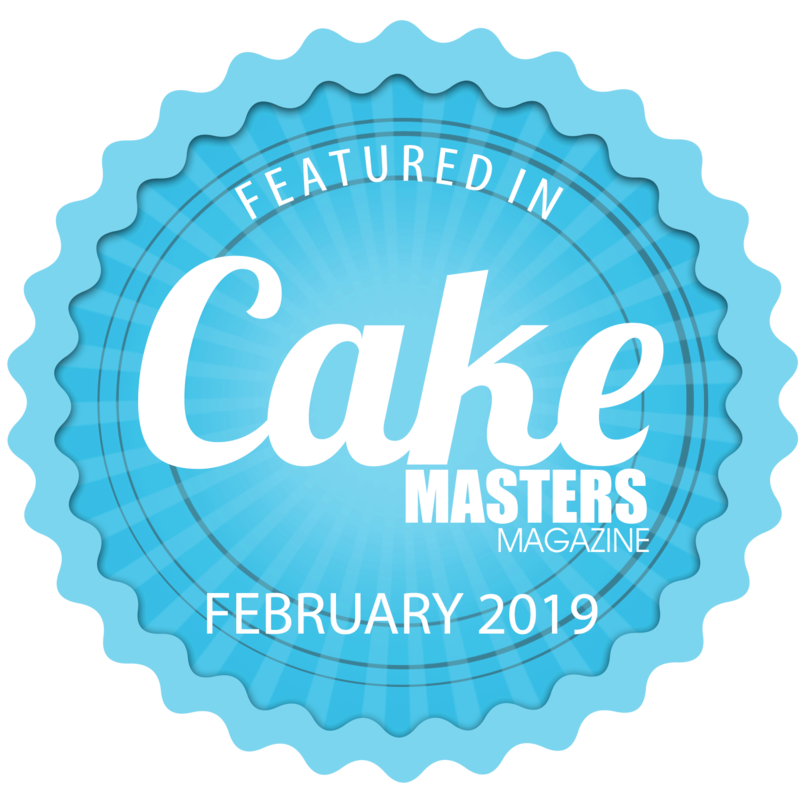 I used the recipe from Pastel Rainbow Chiffon Cake which involves steam baking, because when I'm not feeling lazy, I really love what steam baking does to the cake! I love how the moisture is incorporated into the cake and how lovely the cake rises :). 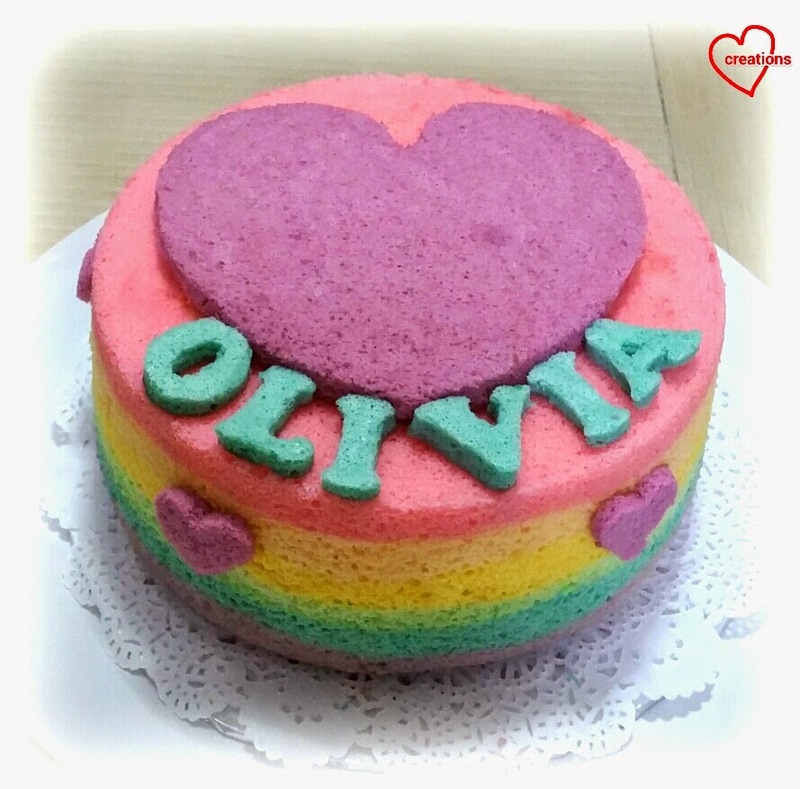 I filled the chiffon hole with rainbow fruit loops and baked extra purple and blue layer cakes to cut out the heart and the name. 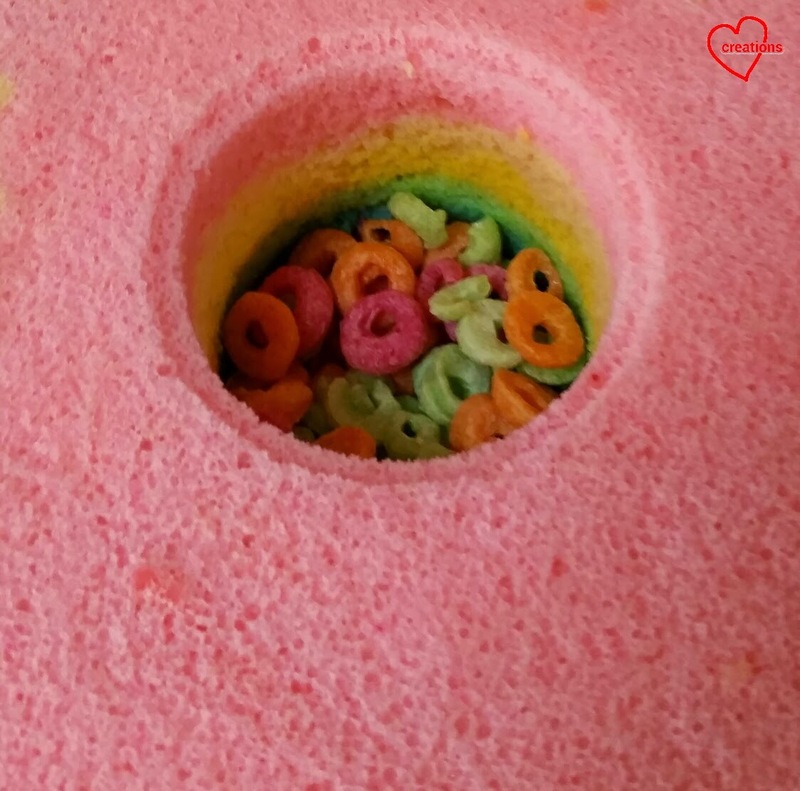 I love how pretty and colourful the fruit loops look within the rainbow hole! The entire confection is put together using melted marshmallows which act as edible glue but is so thin it can't really be tasted. Simply microwave a few marshmallows with some boiled water! Happy birthday Olivia! Hope you had a really great one with such a wonderful mummy! 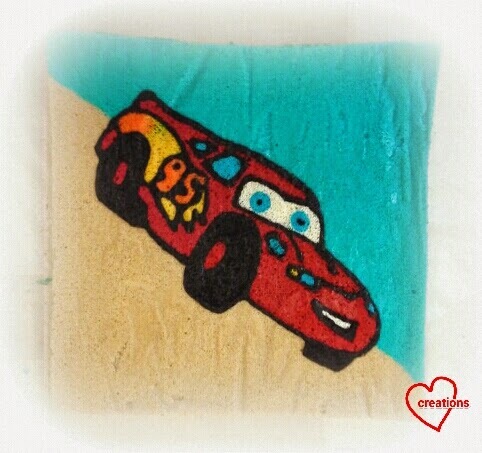 I am supposed to bake a Lightning McQueen birthday cake and suddenly had the inspiration to decorate it with checker board cookies. 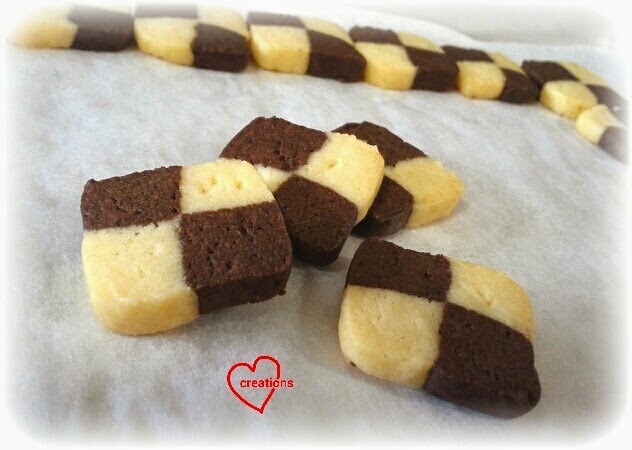 My friend requested for the birthday message to be made from cookies so I thought why not make use of the same cookie dough base to create checkerboard patterns! For the purpose of framing the cake, I made 2x2 matrix patterns, the simplest form of checkerboard pattern :). Sneak preview of the cake! The birthday boy is 5, not 51 :p. That's supposed to be an exclamation mark after "5". Icing the cookies later. 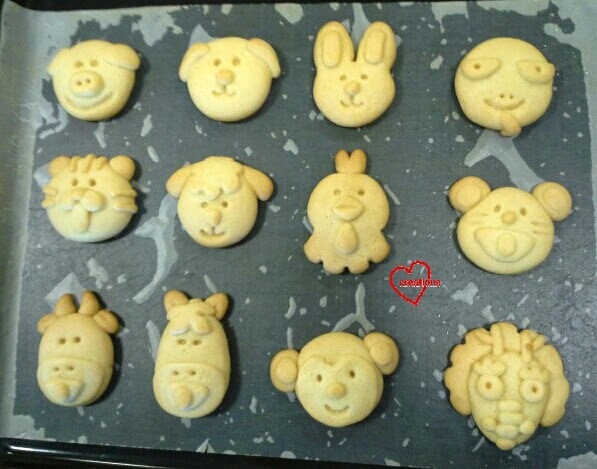 I followed Ochikeron's recipe closely except that I used plain flour instead of cake flour to make cookies that don't crumble too easily for cake decoration purposes. I find it helpful to watch her demo video on how to assemble the cookies. 1. Cream butter and sugar until white and fluffy. 2. Add vanilla extract to egg and mix well. Gradually add in egg and mix well. 3. Sift in cake flour (and cocoa powder and charcoal for chocolate dough). Mix well with spatula until a dough forms. 4. Form each dough into rectangular blocks with square cross sections. Mine were tiny 2x2cm squares for the cake. Ochikeron suggested 1.5" square. Wrap in cling wrap and freeze for 30 minutes. 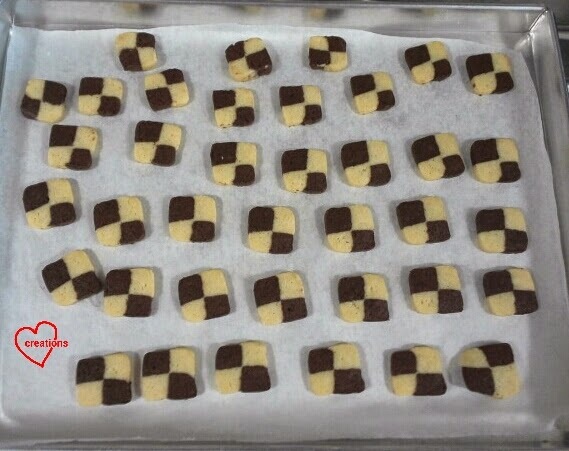 Note: I only used half of the dough to make these checkerboard cookies. The rest were used to make the birthday message. 5. 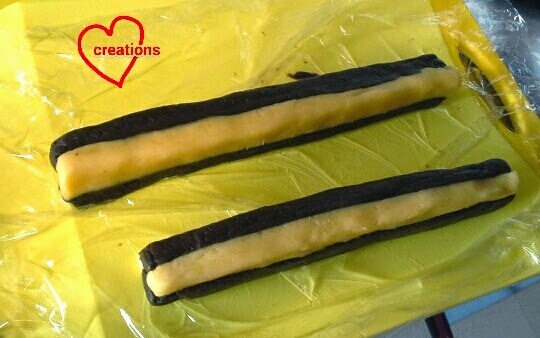 Slice each dough lengthwise into 2 pieces. 6. 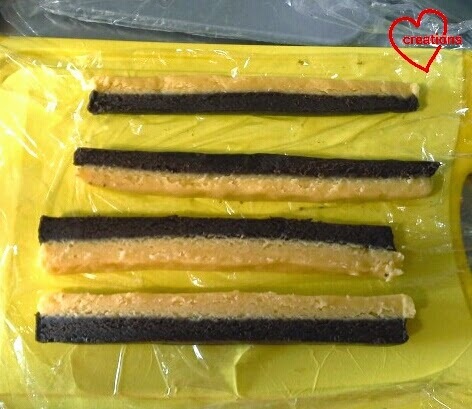 Stack different coloured dough on top of each other and slice lengthwise into 2 pieces again. 7. 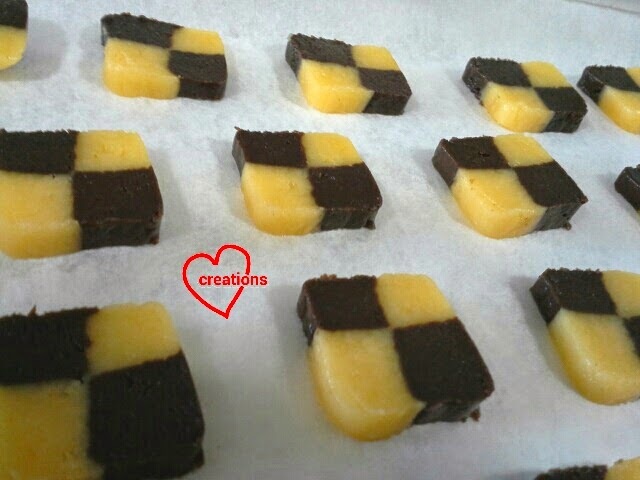 Stack 2 slabs such that the checkerboard pattern is formed with alternate vanilla and chocolate squares. Wrap in cling wrap and freeze for 15 minutes. Need to improve on my block shaping skills! 8. Cut a strip of baking sheet of 5mm in width. Place it on the block of dough and use a bench scraper or knife to mark out where to cut. This ensures that the cookies are about the same thickness. 9. 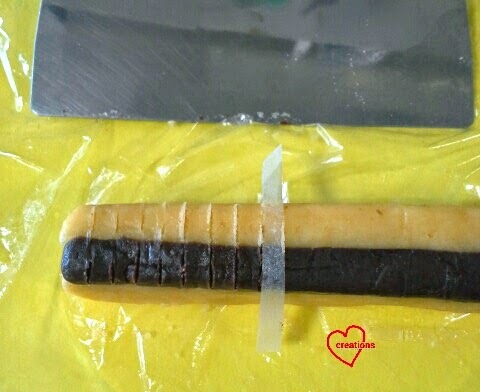 Cut the block of dough along the marked lines and place on baking tray lined with baking sheet. 10. 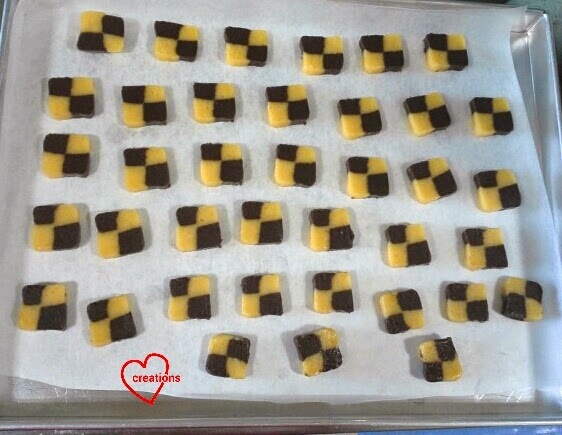 Bake for 8-9 minutes in preheated oven at 170 degrees Celsius for mini cookies like mine or 15 minutes for Ochikeron's larger 3x3 matrix cookies. Bake until the cookies are very slightly golden brown at the edges. Let cookies cool for 5 minutes on baking tray before transferring to cooling rack to cool completely. Store in airtight container. 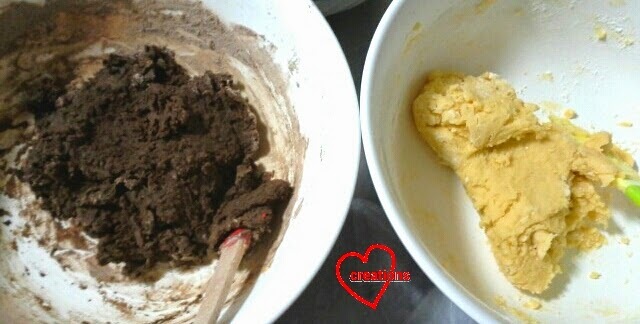 - Gradually add in egg to the dough to prevent batter from separating. 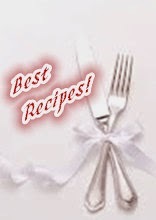 - Allow the dough to thaw a bit if it is too hard to work with. Place it in the fridge or freezer to firm up if it is too soft to handle. - Number of times to slice the block of dough lengthwise is based on size of matrix. E g. Cut 3 strips of equal width for 3x3 matrix. - Always stack blocks of alternating colors to create checkerboard patterns. - The cookie dough can be stored for a long time in the freezer/ fridge in between steps of shaping and before baking like my rainbow shortbread cookies so it's perfect for busy people who want to have cookies on the spur of the moment (when the dough is done) or do not have long stretches of time to bake. 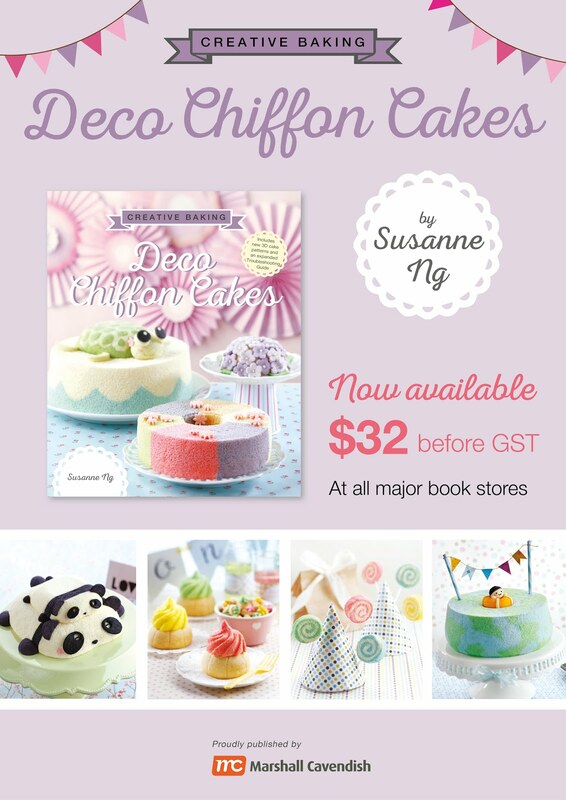 When I saw Aunty Young's post on mooncake biscuits that were soft enough to eat the day after baking, I was tempted to try. My first attempt last year took about a week for the biscuits to be soft enough for eating. I told my elder kid that I would be making this and we planned to have a "playdoh session" together when he's not in school. Here's my set of 12 animals shaped using hands and a few simple household tools! Pardon the poor photography. It's really tough to take a good photo on my phone. Actual color is a richer brown like the one below. 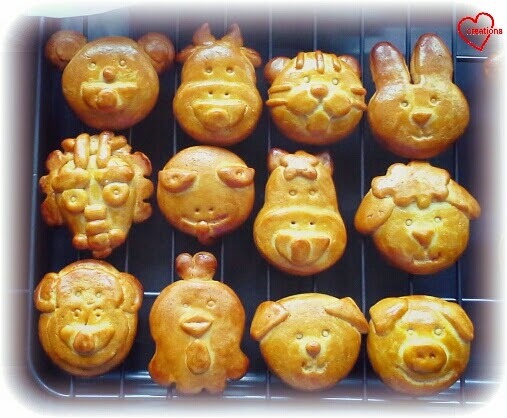 Close up view of a few biscuits! I adapted from Aunty Young's recipe for the biscuit dough but used Ann Low's recipe for the egg wash.
1. 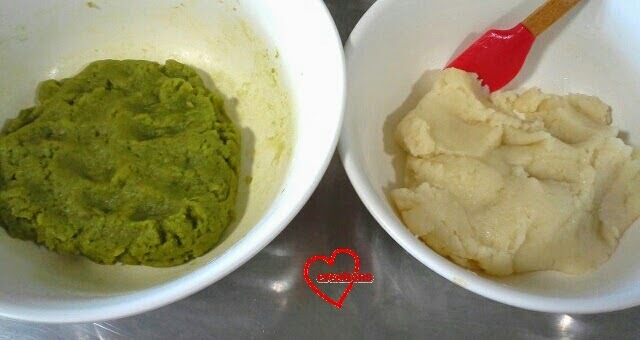 In a large bowl, add syrup, oil, alkaline water and lotus paste. Mix well. 2. Add sifted flour and form a dough. Cover with cling wrap and rest at room temperature for 2-3 hours. 3. 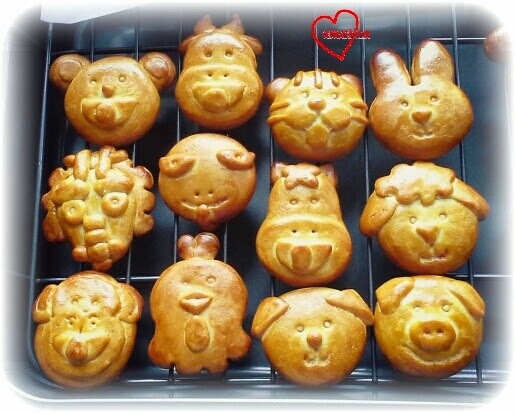 Divide the dough into 24g with some spare dough for animal parts. Shape them as you wish, dusting your fingers with a bit of flour if it gets too sticky. I just used a toothpick, yakult straw, bench scraper and my fingers to do all the shaping. Full set of 12! But not in order. 4. 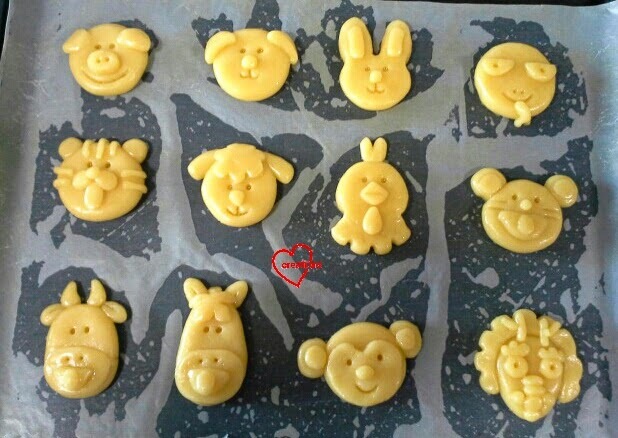 Place the animals on a baking tray lined with baking sheet. Bake in a preheated oven at 160 degrees Celsius for 10 minutes. Remove and cool for 10 minutes. This is how we look like after first round of baking! 5. Brush top of biscuits with egg wash. (I need to improve my egg washing skills... or use a different recipe that is less viscous.) Make the egg wash by combining all the three ingredients and sieving it. Bake again for another 10-15 minutes. Be careful to watch the biscuits like a hawk nearer the 9 minute mark. They start to brown very fast after a certain point. I over-browned my kid's batch :(. 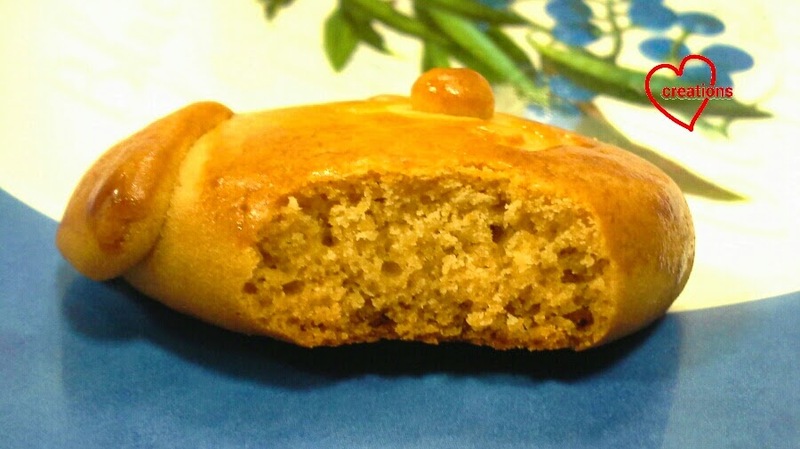 I am pleased to know that the mooncake biscuits were soft enough to eat the next day! The addition of lotus paste really did wonders. An extra one or two more days of storage and the texture was just right for consumption. 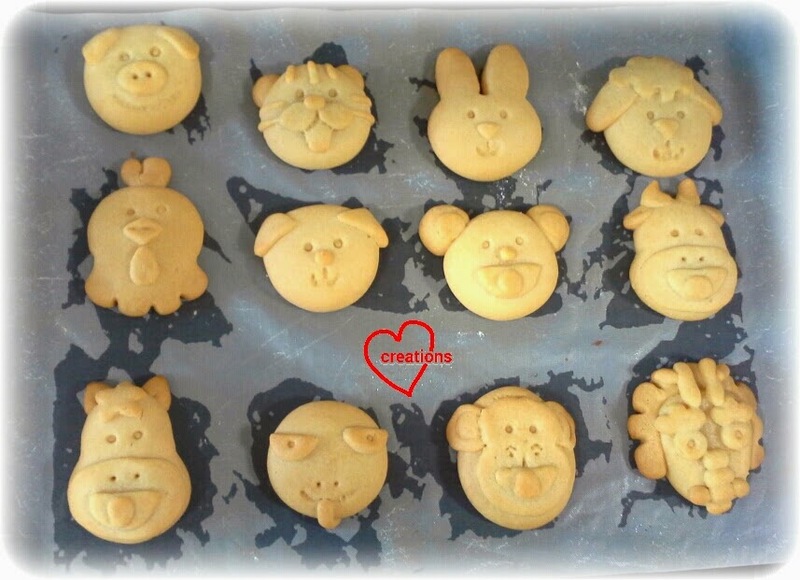 I had lots of fun with my kid at this playdoh session even though the biscuits did not turn out looking perfect. That's the nice thing about messing around with baking together with kids for fun :). We gave some away to our neighborhood kids. The mummies thought I bought special moulds to make these! The kids were of course keen to have stuff that Auntie Phay Shing baked for them again :). 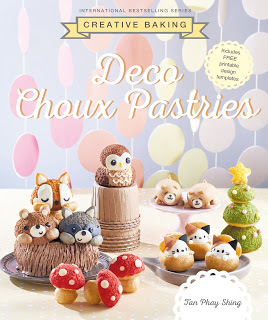 This bake is easy enough to get kids involved. Have fun! Updates: I changed the design of the monkey and made minor changes to the rabbit (added ear pads) and mouse (added whiskers). 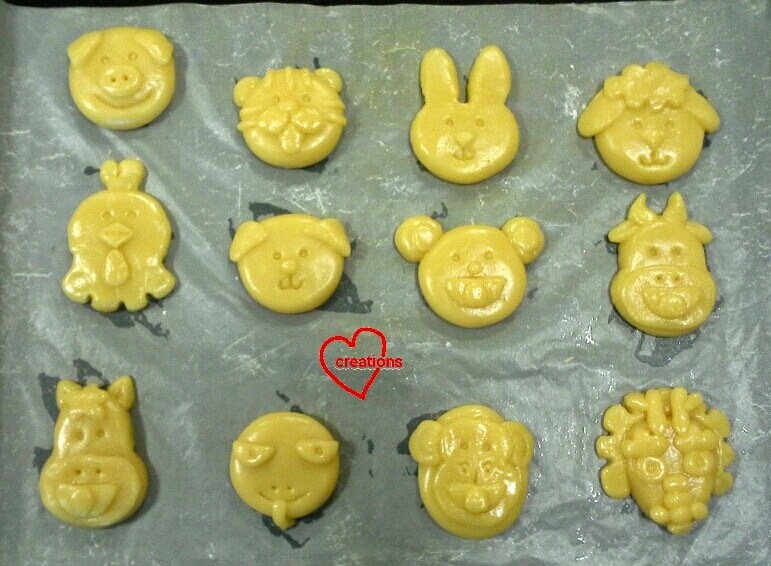 Here are some photos of subsequent batches of Chinese zodiac mooncake biscuits that I made. I forgot to take photos of the final product before packing into boxes for a friend. After first round of baking! I didn't add any flour while shaping the biscuits to retain as much moisture as possible. I replaced 1/2 tsp of water with 1 tbs of milk and a few drops of oil for the egg wash. The resulting biscuits are less brown but it was easier to apply the egg wash.